White/Gold or White /Silver Talit with Lurex Stripes. Lurex means metallic thread in the Gold and Silver striping. High quality wool with pin striping of Gold or silver weaved within the wool makes for a classic and beautiful look. 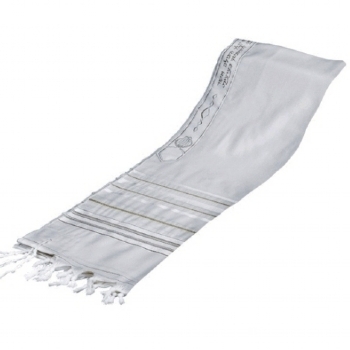 We can personalize and hand tie various options as per below to make this special tallit for you.